Debate continues over supremacy of PC or mobile online casinos. How do you get your casino game on? Maybe you’re an old-fashioned, hands-on kinda player who still prefers to visit land-based casinos for your gambling entertainment? If you’re reading this, it’s more likely that you’re either a PC casino gambler, utilizing a desktop or laptop to access online casinos from the secure comfort of home, or a smartphone/tablet gamer, accessing mobile casino games anytime, from anywhere. As the keen reader may have noticed, I’ve already pointed out the most common argument for supremacy between the latter. Those who use a PC generally prefer the home-bound security of a desktop and personal WiFi combo. It’s also the form of gaming most veterans are used to, and many people will stick to what they know for simplicity and comfort. Mobile players, on the other hand, enjoy the hand-held experience because it’s so convenient. Anywhere you may be, anytime you have a moment to spare, you can whip out your phone and spin the slots reels or play a hand of blackjack. This has been the key selling point for mobile games developers. The PC vs mobile casino games argument is not a new one. It’s been raging on for nearly half a decade now. All the while, the number of mobile casino gamblers continues inching its way northward. According to the most recent statistics from the UK Gambling Commission, mobile casino players finally outrank PC gamblers for the first time; albeit by just a single percentage point. The Commission’s research suggests that “51% of online gamblers gamble using a smartphone or tablet device”. In contrast, “50% of online gamblers gamble using a laptop”. With the two groups being as close to a perfect split than ever before, it’s also interesting to note that, PC or mobile, the vast majority of online gambling occurs at home. The UK’s research indicates “97 of online gamblers gamble at home”. So, let’s set aside the age-old argument of comfort versus convenience. Let’s talk about other reasons—reasons that have more to do with the gaming experience itself—why PC or mobile casino gambling might be the better choice. Getting down to brass tax, there’s only one major reason why gambling on a PC offers a better experience for users. It’s all about immersive game play. Desktops and laptops have much larger screens, often supporting better graphics and sounds. Players are drawn into the games, more closely mimicking the ambiance of a land-based casinos. 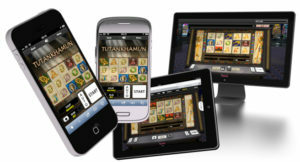 For mobile online casinos, it’s the utility of the device that takes the cake. It’s this small, thin, rectangular object that fits in your pocket, yet is capable of performing just about any task you can imagine; thanks mostly to the modern marvel of global 4G network coverage. Home or away, it just works. The fact that even mobile casino gamblers do most of their gaming from home is a significant factor in the rising popularity of this vertical. It seems to suggest that portability is becoming more important than the realistic touch and high-performance factor of PC gambling. It’s also worth noting that, while desktops and laptops have for many years been considered ‘what most people are used to‘, that detail is transitioning, too. Now, it’s smartphones that we carry everywhere. It’s tablets that are easier to navigate while lounging on the sofa. With these devices becoming the new ‘normal‘, I imagine the ever-so-slight inclination towards mobile casino games will continue to grow, while PC gambling slips further into a preference of the past.